Shivers’, ‘hairs standing up on the back of your neck’, ‘hands in the air’, ‘reaching for the lasers’, and ‘losing your mind’ are just some of the side effects described by Aly & Fila fans when listening to the Egyptian World Top 20 duo in full flow on the dance floor. Since bursting onto the international clubbing scene with their massive hit ‘Eye of Horus’ back in 2003, Aly & Fila have been a constant inspiration to clubbers and DJs alike. Their euphoric, uplifting blend of sweeping trance has seen them rise to A-list status alongside the likes of Armin van Buuren, Paul van Dyk, Ferry Corsten, and many more industry heavyweights. At the forefront of the next generation of dance music superstars, they’ve broken through to the worldwide clubbing elite. Early anthems like ‘Spirit of Ka’ and ‘Thebes’, as well as huge remixes for a number of high profile hits and artists, have earned them worldwide critical acclaim from both the press and fellow artists alike. And it paid off. 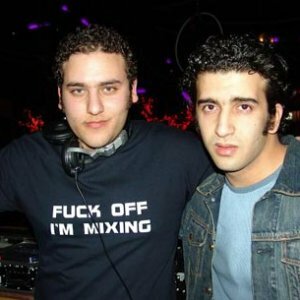 As 2008 headed to a close, the Egyptian duo continued their assault on the dance music scene, sweeping nominations and highly respectable positions in the biggest dance music polls worldwide. They were the 3rd highest new entry in the 2008 DJ Mag Awards, reaching the impressive #31 position. Two years later, Aly & Fila were nominated for an International Dance Music Award for ‘Best Breakthrough DJ’ at the Miami Winter Music Conference, alongside names such as Deadmau5 and Laidback Luke. In 2010, they rose to a Top 20 spot in DJ Mag’s Top 100 poll and represented their home country well with Egypt being voted ‘Dance Nation of the Year’ at Ibiza’s DJ Awards. And the gigs just kept coming and coming. Aly & Fila have toured the entire globe, throwing down at some of the world’s biggest festivals and clubs. Having played at ‘A State of Trance’ events 7 years in a row, Aly & Fila are the only DJs besides Armin van Buuren and Markus Schulz to have done so. Widely renowned for their energetic live performances, they’ve constantly enhanced their all-round appeal to audiences around the globe. Having played at most major festivals, nightclubs, and events the electronic music scene has to offer, Aly & Fila continue to take on the world, one party at a time. In 2009, Aly & Fila launched their very own ‘Future Sound of Egypt’ label, which not only features their own productions, but also provides a home for up-and-coming talents. Tracks by the likes of Bjorn Akesson, Arctic Moon, Fady & Mina, Philippe El Sisi, and many more have found their way into the hearts of trance lovers. The label joined the mighty Armada Music record label in 2010, which was voted the ‘Best Global Record Label’ 5 years in a row. The first result of the new collaboration was the release of the Aly & Fila debut album, ‘Rising Sun’. In the summer of 2012, the duo celebrated the 250th episode of their Future Sound of Egypt radio show with an unforgettable performance in Egypt’s Sharm El Sheik. Their radio show continues to grow, earning the support of the global trance scene. Both the show and the FSOE brand itself are an inspiration to many, resulting in events all around the world. The official ‘Future Sound of Egypt’ compilation series, born out of a shared thought and united passion, is the perfect album series for fans of the label. Representing a magical year in trance and progressive, it’s now heading for its forth volume in 2014. ‘Rising Sun’ was the result of Aly & Fila’s lifelong passion for the trance genre. On the debut album, they joined forces with talented vocalists and producers such as Tiff Lacey, Sue McLaren, Josie, Denise Rivera, Philippe El Sisi, Bjorn Akesson, and many more. Featuring big releases like: ‘Listening’, ‘Paradise’, ‘Still’ and ‘My Mind Is With You’, the characteristic sound of Aly & Fila is well-represented in the successful debut album. In 2011, one of the biggest trance tracks of the year was ‘We Control The Sunlight’ ft. Jwaydan. Arguably the biggest Aly & Fila track to date, it was voted #1 in the A State of Trance Top 20 of 2011. In 2012, it was followed by the stunning ‘Coming Home’ and the Roger Shah collaboration ‘Perfect Love’. In addition to creating stunning originals, Aly & Fila kept themselves busy remixing the likes of Armin van Buuren, Solarstone, Gareth Emery, Andy Moor, Roger Shah, Max Graham, and many more. The summer of 2013 brought the highly anticipated follow-up to ‘Rising Sun’: their second album ‘Quiet Storm’. Aly & Fila:“The album has been worked on patiently, and we want it to create a big impact. It’s like a quiet storm brewing. In those years after ‘Rising Sun’, our music has progressed and improved, we never stopped learning.” The first single of the album was ‘Running out of Time’ featuring Chris Jones. When you consider all they’ve accomplished in such a short amount of time — having rallied the support of some of the biggest names in dance music, having played at some of the most prestigious events and venues across the world, taking the #18 position in the DJ Mag Top 100 of 2013 and continuing to release track after track and remix after remix — there’s no telling where this duo will end up. So be sure to catch Aly & Fila live whenever you get the chance, or tune into their weekly ‘Future Sounds of Egypt’ radio show.